Touch a button on the steering wheel and put your hands up — this Toyota will take it from here. That is the gist of the experience Toyota Motor Corp. offered to reporters Tuesday in Tokyo. 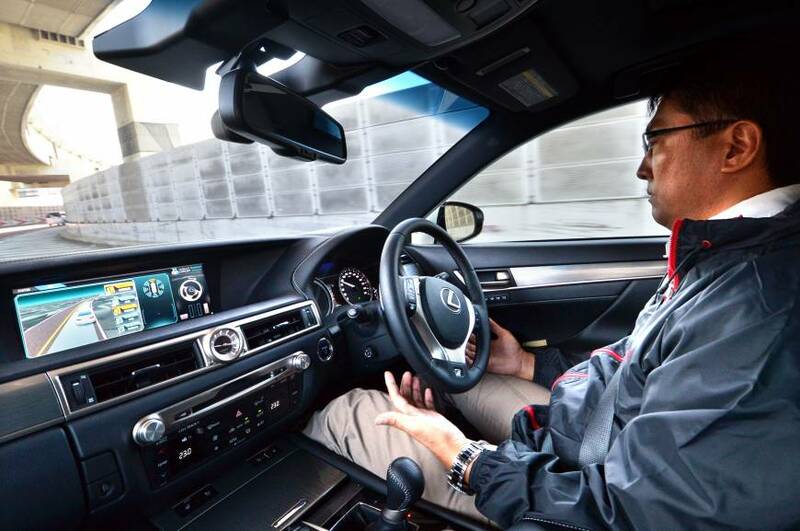 Its “highway teammate” concept car, a modified Lexus GS sedan, pulled off automated feats including entering public expressways, switching lanes and steering to the off ramp, all while picking spots to speed up or slow down based on the surrounding traffic. The demonstration illustrates how far Toyota has come in developing technology that essentially turns cars into co-pilots that boost the driver’s skills. While executives have in the past said they wanted to keep a driver fully engaged, Japan’s largest automaker is now in the same camp as companies like Google Inc. in developing its technology all the way to cars going fully driverless, according to Moritaka Yoshida, Toyota’s chief safety technology officer. The concept car taken for test drives Tuesday was equipped with more sophisticated autonomous-driving features than at a similar event Toyota hosted two years ago. At that time, the automaker highlighted a system for tracing lanes and keeping the car centered. The vehicle had radar that detected vehicles or pedestrians up ahead, automatically decelerating or triggering steering assistance to avoid collision. Those are the sorts of features now becoming more widely available in showrooms. At this point, the modified Lexus concept is only capable of going into autonomous mode on Tokyo expressways. The car can indicate on its center screen as well as play an audio message when it wants the driver to take over if other vehicles are not letting it merge. Returning to manual mode is simple — just grab the wheel or press the brake. The Lexus GS made available to reporters Tuesday was developed in close collaboration with Toyota group suppliers including Denso Corp., Yoshida said. Toyota aims to introduce cars with automated highway driving by around 2020. Yoshida declined to say whether the technology will be made available first in Toyota or Lexus models. “For the future beyond 2020, (the) driverless car is a possibility,” said Yoshida. The automaker will begin selling cars before the end of this year installed with a separate safety technology that uses a dedicated radio frequency to communicate with the surrounding infrastructure and other vehicles. The Crown sedan will be the first of three Toyota models going on sale in Japan this year that can deliver audio and visual alerts when a driver has taken his or her foot off the brake and has started to creep into an intersection. The system also can caution the driver when he or she approaches a red light and has not eased off the accelerator. Once stopped, the car counts down how much time remains until the light turns green. Toyota last month hired the U.S. military’s top robotics engineer as part of a $50 million investment in artificial- intelligence research to build on its semi-autonomous driving efforts. Gill Pratt, who had been program manager for the Defense Advanced Research Projects Agency’s robotics efforts, will direct joint research centers being established by the automaker at Stanford University and Massachusetts Institute of Technology.